24 intense hours in Phnom Penh | About various things! Phnom Penh, the capital of the Kingdom of Cambodia, is a city where history is rewritten every day. No matter how powerful you are, when you first step in this place, you are overwhelmed by unexplained emotions. It is very hard for me to describe the states I have gone through in Phnom Penh, and although I have postponed writing this article so far, I am trying to gather my resources and tell you how my experience was in this city. Phnom Penh has a very sad past, with strong repercussions at present and probably for a long time from now on. I will not go into the depth of historical details, others have done it very well, and the Internet abounds in this. I’ll just make a brief description to get you into the Cambodian reality. If in the 20th Phnom Penh was “the Asian pearl,” between 1975-1979, Cambodia underwent a genocide that was hard to imagine after the power taking by the Khmer Rouge Communist Movement and occupying Phnom Penh. Under the leadership of Pol Pot, in just three days, all the inhabitants of the capital were forced to leave the city and migrate to rural areas. To convince them to leave the city very quickly, the soldiers lied to the population that soon the capital would be bombarded by the Americans, and they must be saved. In fact, all citizens were wanted to work the land, and Cambodia became a major agricultural cooperative. Those who refused to leave were executed on the spot, both adults and their children. Bloody Pol Pot wanted the entire population to be made up of peasants, and one by one, the intellectuals were killed: doctors, teachers, speakers, even those who wore glasses. Starting from the statement that “This is the year zero” and that the society is to be “purified,” Pol Pot has isolated the country from any external influence: it closed the embassies, expelled foreign citizens, closed schools and hospitals, forbidden religion and the use of money. In the past few years that Pol Pot led Cambodia, 25% of the country’s population (2 million people) were killed, starved to death, working under inhumane conditions, or on their way to rural areas, called “the march of death” . For a complete article on the history of this country, I would recommend you click here. Today, Phnom Penh is a very welcoming city for tourists, people are struggling to recover even though the contrasts appear here quite frequently. A big part of the city’s population lives at the poverty line, with $ 1 per day, while foreign investors raise hotels, some more imposing than others. A simple walk across the streets of the city brings you, at a time, into the world of “princes” and “beggars”. While some children walk barefoot among the household waste on the sidewalks, two steps away, some gentlemen park their Lexus in front of gates beyond which ordinary eyes can not penetrate. In no other city in the world have I seen more Lexus cars next to each other like in Phnom Penh. People are warm, respectful and pleasant, they don’t try to trick you and make you feel like a friend of theirs. You see them struggling to overcome the difficult moments of the past and move on to the modern world: building blocks, malls, and office buildings alongside attracting tourists and promoting visiting objectives. Phnom Penh is not an expensive city, starting with food, transport, accommodation and sightseeing, all are practiced at prices you can afford. After a relaxing time on the beaches at the edge of the jungle bathed by the turquoise waves of the incredibly warm sea, we ended the holiday in Cambodia, spending a day in the capital of the country. Although we could have opted for an internal flight from Sihanoukville to Phnom Penh, we chose to try land transport as well. For $ 18 per person, we were picked up by a bus in front of the Otres 2 complex where we were accommodated, and in less than 5 hours we were at the entrance to the city. 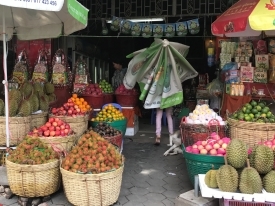 The road between the two cities was the way I expected: vast orchards of cocoons, bananas or mangoes, houses built in the midst of reddish dust, and people selling everything on the roadside. Our bus left us somewhere at the entrance to the city, and we were already busy with two bulky trolleys. Immediately we were approached by a few tuk-tuk drivers who proposed to take us to the hotel for larger amounts of money. Finally, we found a tuk-tuk with $ 5 and we went curiously to the place of accommodation. 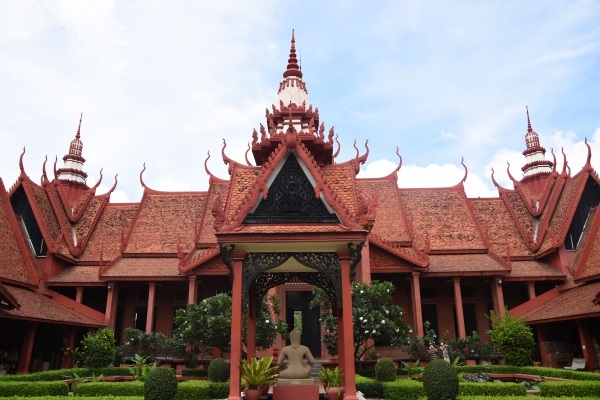 Like any other capital of the world, Phnom Penh has a fairly large airport, very close to the city, about 10km away and operates both domestic and international flights, and the low-cost Air Asia company links the city to the main Asian countries. So it is not difficult to get into this city, and if you come from another Asian country, airlines prices may be quite low. Once at the airport, you have dozens of taxis or tuk-tuks that take you to the city in less than 30 minutes for $ 7. Distance between cities is quite high and if you want to get to Phnom Penh from any other city in the country and you do not want to fly by plane, even if the distance is great, you can choose the bus or autobus just like us, take the pulse of the country and admire the landscapes, people or homes from the car. 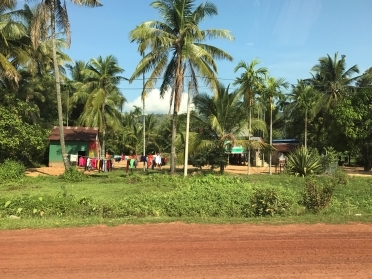 There are bedside busses where you can stretch in, but they are inserted for more than 10-12 hours trips, for example, from Siem Reap in Sihanoukville. 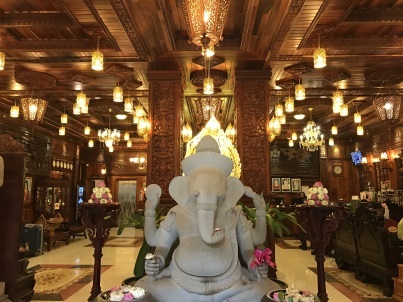 We spent 24 hours in Phnom Penh, so we stayed for just one night and for this I made a reservation from Okay Boutique Hotel near the National Museum, but I did not read much about it. 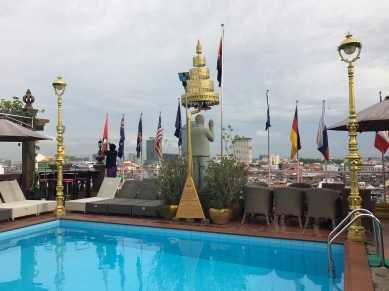 Accommodation rates in Cambodia’s capital are acceptable – starting at $ 15 per night, the most important aspect I’ve taken into account was the location. Neither the room was left desirable, very nicely decorated, clean and, above all, with a stunning view of the city, the Mekong River, the Royal Palace and the National Museum. This place we were going to visit and about which I read a lot of information, is 15 km from the city. The road we have been through has been a mixture of amazement, fear, pleasure, confusion. From the tuk-tuk level I saw, in 30 minutes, the time passing between the horns, exhaust fumes, fruit stalls, thousands of scooters, but all of that gave me a good feeling. I liked the city I was in and I was trying to find out about more in a few hours. All this time I thought I was ready to go to such a place as the one that, 40 years ago, had become a common pit for children, adults and the elderly. How wrong was I! 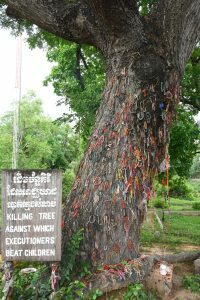 As soon as I crossed the Killing Fields parking gate, I felt something heavy on my chest, and my heart struggled to beat with force, pressed by an invisible force. I do not exaggerate at all if I say that for two hours, as long as our visit went there, I felt tears on my cheek. The place has an incredible emotional load, and from the moment we put the earphones on the ears and started the audio guide, we went into another world, one of torture, suffering impossible to reproduce in words and real noises imprinted for eternity. How can I give you the sensation I experienced by listening to the real voice of a survivor of this genocide, or how would you perceive if I told you I even heard the voices of torturers who were telling the details of taking the children next to their parents and, under their terrified looks, slammed them to the trunks of the palm trees until they killed them? Believe me, it’s hard to remember. I’m just telling you, my hands were shaking so hard that I could push the camera shutter down only for a few times, and I told Dan almost obsessively I could not take pictures. Life goes on and I’ll find out this soon after our tour ends and, as we approach the gates, I suddenly get thirsty. Just before the exit was a refreshment kiosk, I took a soda and I could not drink it until I got out of the perimeter, I got to tuk-tuk and saw our cambodian driver who laughed and made jokes with a friend, a sign that the past is somewhere far away. The first time I saw this scene I was angry, I was looking for explanations how they can laugh while I was upset and I wiped away my tears, but then I realized it was the natural course of things. They got up and went on, though, probably, every family in today’s Cambodia has at least one mother, father, sister or brother who died in terrible torment. And if today more than 50% of the country’s population is under 15, it is proof that their grandparents are no longer here. A new day in Phnom Penh and the last one in Cambodia. Our plane to Bangkok was about to take off at around 6 PM, so we woke up very early in the morning with the desire to make some more tours around. A breakfast in an absolutely fabulous restaurant with spectacular ornaments and waiters watching each table carefully gave us the energy needed for a new exploration day. The day before we had settled with the tuk-tuk driver and today we went to other targets we wanted to reach. The first on the list was the market in Phnom Penh that I only read interesting things about, attractive prices and interesting things. It’s just that when I get to an Asian market, I forget about myself and other plans I’ve done before, and I’m losing myself between stalls, coconut, pants, and elephant bags. Dan tried several times to make me aware of this thing and to suggest that we better leave the market and go to see something through the city, but until I did not feel like I lose my feet, I did not give up 🙂 The prices are really small, and if you have the patience to walk through the vastness of the market, you can find very good quality cotton t-shirts at 3-4 $, 500ml coconut oil at 4-5 $, as well as various cheap souvenirs, only good to fill another trolley. We came out of the market quite agitated and having some shopping bags we headed for the tuk-tuk that was waiting for us. Right before we left, the driver proposed that we should go to Silk Island during the time we have at our disposal. I guess that he has an understanding with the sellers there and that he gets profit if he goes to them and we buy products. Especially because there was a lot of posters on his tuk-tuk with the extraordinary tours he organized at the Silk Island. 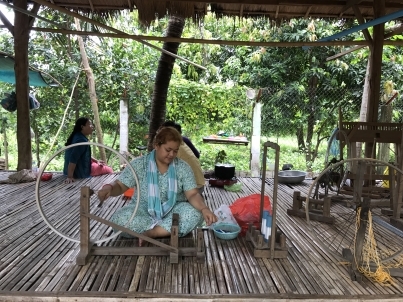 However, we accepted, but only after promising us that we would not lose the plane 🙂 A new crazy walk followed through the city, crossed the Mekong River with a ferry, then walked through the village. The first stop was a family that worked from dawn to silk scarves and from which I also bought one with $ 10. It did not seem like a great price, especially since they presented us the manufacturing process that is manual and not an easy one, and they were glad that I did not insist on negotiating. In addition, a young woman who worked on scarf, she was extremely happy to practice English with us and told us that this year she graduated from college and applied to two master scholarships somewhere in Europe and that she is now waiting for the universities’ response. The next stop was at a silkworm farm, where I saw the whole silk obtaining process. The guides that made us tour of the farm had a crazy chat, while we were just staring at the clock. I bought some very beautiful scarves but I also received one as a gift. Dan did not want to enter the store with thousands of scarves and waited outside. When I came out, take it from where he is not 🙂 I looked around and saw it a little further, talking to … an Indian blackbird 🙂 For some good minutes, we had fun with the most beautiful talking bird in Phnom Penh, we did not understand her, she did not understand us, but in the end all three of us laughed, you can see a funny movie here. Transformed today into the Genocide Museum, this building was a former school used by the Khmer Rouge to torture people before killing them at Killing Fields. We haven`t have the power to visit this place. What we have seen at the Killing Fields was too much, but if you are strong enough, I recommend a tour of the prison. We left from the Silk Island directly at the hotel, prepared the luggage, and because time was still in our favor, we met with our tuk-tuk driver, whom we asked to take us to visit the Imperial Palace that was pretty close to us. There, surprise, the program was from 07:30 to 11:00 and from 14:00 to 17:00, so it was closed during lunch. The only place I could go to was at the National Museum, two steps from the Imperial Palace and a lunch program at lunchtime. We did not have much time here, but we were surprised by the architecture of this museum, which is particularly beautiful. At the exit, an elderly gentleman in a wheelchair was selling books. I did not mind thinking when I gave 30 $ on two volumes that caught my attention: First they killed my father and Lucky child, the first becoming the national bestseller. Both volumes are written by Loung Ung, one of the seven children of a family of senior government officials in Phnom Penh, before the Pol Pot regime. 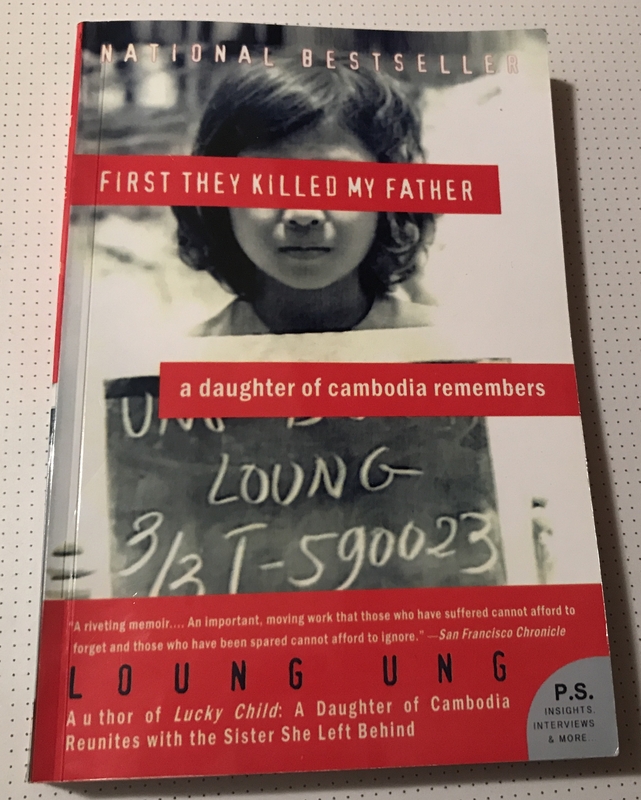 Luong Ung relives in these volumes moments when, when she was 5, she and her family were forced to leave the city and go to rural areas, as well as the dramatic events they had survived, but also the moments in which they had their father killed, their mother and other family members. There are two volumes written in English, that keep you breathless, and which I recommend you to read. I have read the first volume that captivated me until the last word and I would like to give it to one of my dear readers. Leave a comment on this article telling me why you want this volume and on December 15 I will choose, via random.org, a winner. Also, please share this post on Facebook to let your friends know about this giveaway. Be sure it’s public so I can see it. Our trip to Cambodia took place in April, exactly when the temperature exceeds 40 degrees, but the best time to reach this part of the world is in November, December and January, when the average temperature is around 30 degrees, and rainy days are rare. Instead, in the rainy season from June to October, I do not recommend you to plan your holidays in Cambodia, if you do not want to stay more in the hotel rooms. Our trip to Cambodia is over, but not the desire to return there, because we still have a lot to discover. Subscribe to my blog and you’ll find out first when I publish a new article! Until next time, I’ll leave you with more pictures of Phnom Penh here. Thank you to all who have understood the message of this article and to those who left a comment here, but also to those who commented on Facebook post articles. You all deserve a souvenir from Cambodia. The gift I am very emotionally attached to, the book “First They killed my father” I bought from Cambodia, will go to Mrs. Julieta Botocan from Giurgiu! Congratulations! Great post! I really like the pictures they bring the story to life! Cambodia is one of my favorite places to visit because it is very cheap. Kampong Phluk-satul plutitor din Cambodgia | About various things! Interesting trip full of contrasting emotions. The return from the death fields with tears on the face, and the people who laughed Loudly. But you have to excuse them, they shouldn’t have to remember such Dark days for more than 40 years. You yourself forgot the painful moments after you went to the silk village. And spent couple of hours buying your favourite products. Each time we trying to imagine the places you are talking about, You surprised us with photos that end up our imagination. One of my friends was there as a UN police officers, and spent there over than a year, but he didn’t tell me about all the details that you told us about it. 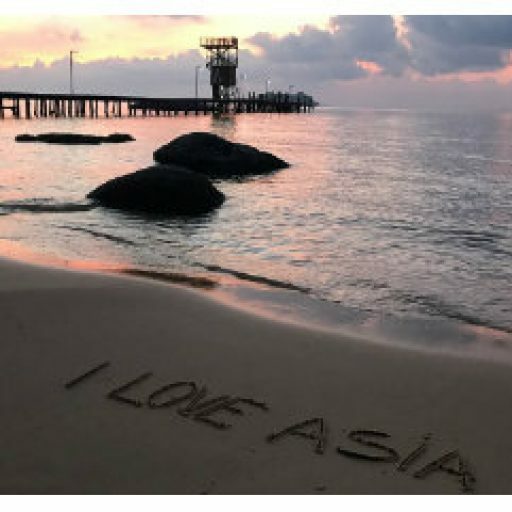 Thanks a lot beautiful lady for joining you to your amazing trip.